Nutrition is a key component if a swimmers want to achieve their best.There is a large amount of information on sports nutrition for young athletes available on the internet. 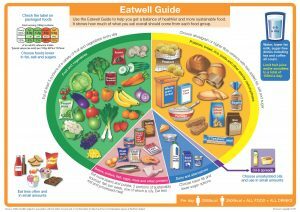 Below are links to four British Swimming leaflets on different aspects of nutrition. Click on the image to view the Eatwell Guide. The main source of energy during training is derived from carbohydrate, therefore, it is not surprising that high carbohydrate meals and drinks are essential to provide energy and facilitate recovery. The timing of meals and snacks, however, is important. * After high intensity training it may be appropriate ingest protein mixed with high carbohydrate. This may be achieved using known brand formulated drinks. Have a snack item (examples above) with fruit juice 30 minutes before training with breakfast and after training. Before a race: High Carbohydrate/Low Fat meal 2-4 hours before the race. Suitable types of food include: breakfast cereals, porridge, bread, rolls, toast, fruit juice, fruit, rice cakes, plain crackers, boiled rice, potatoes, boiled pasta, dried fruit, oatmeal biscuits, plain wholemeal biscuits, muffins and carbohydrate drinks. These are all examples of complex carbohydrates as these release energy slowly. Avoid simple carbohydrates (the sugars) as these release energy quickly but trigger the release of insulin, which can have a negative impact on performance. A small snack (examples above) may be eaten about 30 minutes prior to the race. If the interval between races is less than 30 minutes: The swimmer should drink fluids/juices or a sport drink. 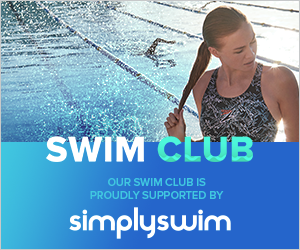 If the interval between races is up to 1 hour: The swimmer should have a snack from the above list, with plenty of fluid, up to 30 minutes before the next race. If the race interval is 1 to 2 hours: The swimmer should have a small high carbohydrate/low fat meal. If the rest period between races is longer: The swimmer should have a substantial meal no later than 2 hours before the next race (see before a race). Important: As water is stored with carbohydrate it is essential that substantial amounts of fluid is drunk with meals and snack. The importance of swimmers staying hydrated during training and at competitions cannot be under stated. Swimming pools are hot and humid environments and dehydration is a real risk and can result in lower performances in the pool, reduced concentration, reduced power and mood changes. This is especially true when swimmers spend long days at swimming galas. The following information on hydration is from British Para-Swimming. A reduction of just 2% of fluid can result in degraded performance by as much as 10-20%. ; the difference between winning a race, making a PB or a squad time. 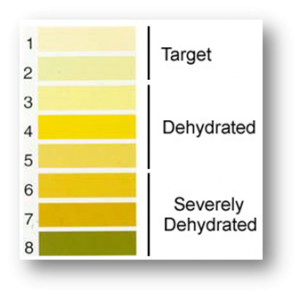 One of the easiest ways to detect dehydration is thirst. But, unfortunately, by the time this warning sign kicks in you are likely already dehydrated. Also, a simple urine test is helpful to know if you’re getting enough water. 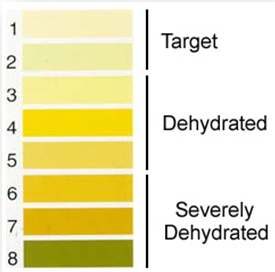 Look at urine colour (using the chart below), volume and frequency – the aim is for urine to be clear in colour, plentiful in volume, but frequency should not be to the extent where it continuously interrupts training sessions. If urine colour is dark and volume and frequency is sparse, then more fluids should be consumed. Swimmers should make sure they are properly hydrated before, during and after training or racing. An essential for any swimmer is a large plastic sports drink bottle. NEVER BRING GLASS BOTTLES ON TO POOLSIDE. Before Exercise: Ideally drink 500ml two hours prior to exercise and 125 – 250 ml immediately before to reduce the risk of dehydration. This may not be possible in early morning sessions. However athletes should ensure that some fluids are consumed, as the body will be dehydrated from the overnight fast whilst sleeping. During Exercise: Athletes should try and drink at regular intervals during training to reduce dehydration. A rough guide for 125 – 200ml to be consumed every 15 minutes. Athletes need to be careful as it is possible to drink too much. After Exercise: Fluid replacement should begin immediately after exercise; athletes should try to drink 600ml as soon as possible. Athletes should also try to keep sipping on fluids throughout the day in order to maintain the recommended 2 litres of fluid outside of training.